» The United States Is . . .
Just the latest in a shooter rampage. And of course, this one at the end of a peaceful protest for Black Lives Matter, which stemmed from the killings in Baton Rouge and Minnesota of 2 black men by police. Our cities are erupting with these protests, as in this day of social (instant) media, both shootings of the men in days prior were captured—one as it occurred, the other right after—in shocking living color, and streamed all over the world. Not since 1968 has this country appeared so deeply divided on the issue of race. Appearances can sure be deceiving, though, can’t they. And as people all over spew rhetoric and blame, there seems no common ground. Even though the majority of what one sees on social media is parroted with no fact checking at all. There’s a lot of absolute falsehood propagated from both sides. For a country founded with the tenants intact of slavery, the issues goes back to our roots. All men were not in fact, in our country’s beginnings, created equal. Complicated indeed, this race issue. We fought a war over it. Of course, the South fought the Civil War to preserve a way of life based on slave labor. But as much as we revere Lincoln, the North didn’t fight that war to abolish slavery, which indeed provided the spark. It fought because the southern half of this country seceded. And yes, he was successful after enormous manipulation behind the scenes, and the Emancipation Proclamation went into law. But very little about this issue today is truly black or white. We indeed live in shades of gray. The symptoms, of course, are starkly divided. But again, the roots run silent and deep. And erupt in pockets, loud on the brittle surface of a tenuous peace. If this weren’t so, the vitriol from both sides wouldn’t erupt—swift and sure and bloody—with each new bitter conflict. The powder keg needs a simple spark in order to blow apart. On the one side, some people point to Ferguson two years ago, and yell that the officer acted in self-defense. A grand jury agreed. And indeed, it appears so from the video. But in a community that has felt persecuted for decades, this was seen as just one more example of police brutality, of racist cops. Odd how, as well, the department there didn’t look like its residents . . . Enough holes exist in that statement to derail this blog, so I’ll just leave that as it is. But good grief, white-on-white murder rates are almost that high. We all know the statistics. Approximately 12–13% of the American population is African-American, but they make up 35% of jail inmates, and 37% of prison inmates of the 2.2 million male inmates as of 2014 (U.S. Department of Justice, 2014). And of course we could go on with these. But just that is enough for here. I have friends in law enforcement. They’re good people. They have tough, wickedly scary jobs, their lives in danger every day as they leave for work. I don’t know about you, but my work life doesn’t bring me to death’s door each day. Nor do I live where violent crime is the norm. I live, literally, in a different world. A dear friend of mine, a former major-city investigator, distraught about Dallas, told me that his partner died in his arms. Each and every one of these incidents where policemen are killed, cuts him to the core. Emotions run pervasive and deep . . .
Another friend, an activist who has marched in Dallas many times, said that the Dallas police always marched with them. No riot gear. Just officers trying to protect the people and their rights to freedom of speech. An African-American woman, in the midst of this standoff and its chaos, who had marched in the protest, talked about how it had been so peaceful. And yes, she was there to enforce the idea that Black Lives Matter. This isn’t to say that Dallas is pristine on race relations. Not at all. We’ve surely had our problems. But Police Chief David Brown—an African-American—and Mayor Mike Rawlings—an Anglo—have worked diligently to improve relations between police and the community. Especially the inner-city community, and places ridden with crime. They have done a spectacular job handling this crisis. As they have been doing for years. Complaints against excessive force by police are down 2/3 since Brown came into leadership. 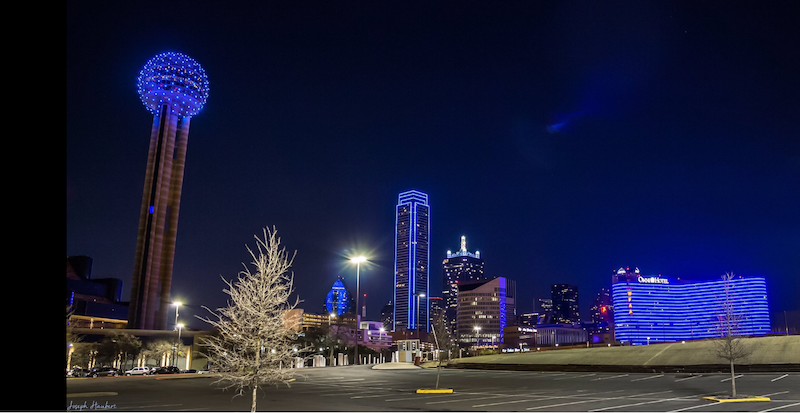 The overall crime rate in Dallas is down to a 50-year low. And we could continue on with similar statistics. The point being that Dallas’ diligence on race and police issues has been quite effective. So the question remains—what do we do about all of this? The first thing is to stop digging the hole. Which of course, just means for both sides of onlookers to quit spewing hate, almost all of which has no basis in fact. Again, the ignorance of actual facts on social media is astonishing. It’s almost impossible to find common ground when you’re shooting at ghosts. So many of the recent mass murders—for a plethora of causes—have been committed by people of all colors, who had previously demonstrated mental illness or violent tendencies. But we can’t talk about that, can we. One way or another, though, the hate-filled rhetoric stirs them into insanity. Mental illness and fire power are always such a lovely alliance. That combination is the elephant in the room. Perhaps if we can one day sit calmly and talk, we can face it. Isn’t it funny how politicians blame the media for our divide? When the media is reporting (albeit, ad naseum), all of this. And quite often, they’re showing the intolerance and hatred spewing out of the mouths of politicians in the first place. Real helpful. At times, it is embarrassing to be from Texas. But more to the point, such rhetoric makes it quite difficult to find common ground. Which is, after all, the true insanity. We hear both sides yelling that they won’t compromise their values. Well, who, exactly, is asking them to? When we boil these issues down to their essence, don’t we all want the same thing? I live in the country, and I’m just about the only Anglo in my neighborhood. Everyone else is pretty much a shade of brown to black. And you know, I don’t even think about it unless contemplating something like this. Funny thing, the longer you live around people who “look” different, the less you notice any differences. Because all of these are good, hard-working, family folks. We take care of each other. When little Alex from across the street brought his Chihuahua over, its leg dangling in the wind, for me to heal (because of course, I am the dog lady), crocodile tears streamed down his face. Although the family works very hard, they didn’t have the dollars for extra expenses, out of the blue. And of course, I couldn’t stand seeing sweet Alex cry, so I had my vet set the broken leg, and tend to the follow up as well. So incredibly thankful, Alex’s mother now feeds me. Literally. And often. I got the far better end of the deal. And I don’t even want to think what I’d do if not for Frank and Lupe next door . . .
And all these shades of skin color in my neighborhood, well, funny enough, we all want the same things. We all have fears (and yes, for many of these boys I’ve watched grow into young men, I fear daily for them as they go out into this world). We all bleed when cut. We all love deeply, profoundly, and want what is best for our families. Please—don’t talk to me about Family Values as if half the country doesn’t have them. It’s not that our values are different. For any of us. We have differences of opinion on how to best affect the successful implementation of the laws and policies that uphold these values. But our values are the same. That is Truth. I often read and listen to folks who see things quite differently from how I do. Decades ago, I heard the political columnist George Will—with whom I rarely agree, although sometimes do, but who always make me think—say that the beauty of this country—indeed, what has made it great—is our ability to compromise. It is how this country has functioned and thrived for 240 years. It is the very essence of what has made us great. Until somehow, over the past decade and a half, we’ve lost that ability for conciliation. Indeed, the very idea of compromise is now seen as weakness. Just ask our Congress. The very thing that made us great, which is at the very root of who we are, has been turned into a negative. One of the most important distinctions to come out of the Civil War was and is a change in the verb used after United States. Although this seems like a simple thing, the ramifications were and are huge. We became one family, one people, one Union. Like any family, we have issues with one another. Like in any family, some just don’t like others very much. But as in any healthy family, we co-exist anyway. Do we want to be healthy? Do we want to stop the madness? It requires a bit of respect for those we see as different. To realize that we might look diverse, but we all bleed red. So, I, too, am heartbroken over the events of the last week, the last months, the last years. Heartbroken for those on both sides of this insidious issue, and for everybody in between. But what I know for true is that we can solve these problems. It takes ears to listen with. It takes hands being sat on if need be in order not to point fingers; tongues to be bitten bloody so as not to spew hate. It takes a willingness and action to disseminate the facts from the fiction. It takes a want to. And it takes enormous courage to tackle the beasts, the most fearsome of which lie within our own breasts. Shun the hate mongers. Listen to the rational voices. Support the oppressed. Understand why they feel the way they do—I can guarantee you it’s not something they made up. Support law enforcement—the vast majority of whom are good, hard-working folks—all over the country but especially in Dallas this day. They lost family. By Tuesday, applications to DPD surged. The young men killed last week have families who grieve. So do the Dallas police officers. In the end, we are all the family who grieves. Yes, a complicated issue, indeed. But we can stop the insanity. A wonderful, thoughtful article about this subject that we shouldn’t even have to think about. Surely our country can do better! We ARE better than this, Beth. I believe in us, as a people. We can fix this. Very insightful, Susan. What a wonderful community you have! And it is just the type of community that has been lost as the mobilization of America accelerates. And while it isn’t the entire problem, I believe “isolation” is one of the primary causative factors of mental health deterioration. I so agree, Donna. I’m so blessed to live where I know and love my neighbors. What a difference it makes . . . So many people are hurting and its easy to be confused and blame others when it seems you have no control. Every conflict reminds us that differences do not give the right of one group power over all others. This is a world-wide clash that takes place everyday somewhere in the world. And, until we can learn to compromise and respect one another nothing changes. Thanks you for a beautifully commentary. I really think that’s it, Joyce–when we get confused, when our hearts break at the horrors happening, we want to fix it so badly that we tend to do so by blaming. It’s really hard to sit in the pain. But it’s from there that we see how similar we all are, which is where our respect for others comes in. Thank you for that! Wow, Susan. You wrote this post so eloquently. Thank you. I totally agree it is not an easy topic to write about, let alone find a solution. I just hope the solution comes forward sooner than later and it benefits both groups. I’m just so broken hearted it all just poured out. And I’m with you–sooner rather than later . . .
Where does one begin to respond to the depth you covered? I do believe it comes down to the same factors that are needed in families, relationships, politics, communities- respect, no blame or right or wrong, listen, compromise. Sadly there will be individuals who will not understand this, who will bear arms against others, but let us not blame one group for an individual. I love that you wrote most of your opinions & thoughts before telling us of the community you live in where you are in the minority. Very powerful writing. I agree 100%, Roslyn–it is the same factors, wherever people congregate. And how easy it is to blame an entire group for one person’s behavior. When we’re all just people, in the end . . .
What a powerful and insightful post, Susan. The situation is truly heartbreaking. We have a similar problem here with the Fist Australians, the Aboriginals who make up a huge percentage of people in jails. I think every country has its racist demons to deal with. People get shot here too, but not as many or as often as we have different laws regarding gun ownership. Mental illness and firepower truly do make a powerful alliance. Interesting, Tamuria. Racism is such a pervasive demon . . . In attempting to come to some understanding of what is happening to our humanity, I’ve been asking myself, “When did we stop seeing our differences as beautiful?” And then I am reminded that maybe we humans never have. A very powerful post, Susan. As someone who stands for peace and inclusion, I am at a loss for words. I know it is a complicated issue and yet is really very simple. Honour the humanity in each other, regardless of colour, size, or shape. Thank you for sharing your thoughts and heart with us all. May we be the change we want to see in our world. That’s the antidote, Beverley. Former President George W. Bush had a great line at the memorial service yesterday: “We judge other by their worst actions, and ourselves by our best intentions.” Brings things straight back to us being the change we want to see . . . Yes, Susan, I believe we all do want the same things. We want peace and harmony, to feel safe and valued, to live our lives in joy, laughter and collaboration to bring about more of the same. My spiritual life and teachings say it is in the chaos we find our roots again. Change happens when things get shaken up and we shine a light on the deeper issues. Once we see them, we have opportunity to choose and evolve into a better way. The way that serves all. It breaks my heart open to see the devastation that is happening. I know I must hold the intention for the betterment of us and avoid getting angry or showing up with a fighting spirit. I think of what Mother Theresa said something to the effect of – invite me to a war rally and I will not come, but invite me a peace rally and I am there. Beautifully said, Teresa. In terrible times, we do tend to focus on what we don’t want, no? Mother Theresa’s sentiments–and yours–help us to focus on what we DO want to happen. Thank you for that reminder. This is a very well written blog post. I really appreciate it. I’ve been having a hard time discussing these issues. I honestly can not believe where we are these days. There is just too much negativity and violence. It is tough to discuss this, Jenn. The issue is so charged, and heats up so quickly. But we have to try . . . Awesome post! The state of the country is really sad at this point and I hope we all just get together and figure it out. That’s exactly what it will take, Agnes! We have the power to change the climate of society. I acknowledge you for speaking your truth about an extremely controversial topic! Thank you, Dionna. We do have that power. And together, we can succeed! We, ALL Americans, are surely divided but it isn’t just about race… but religion, sexual preference and legal status and everything. I believe that those who are legal here, belong here.. pull your weight though. I believe the no matter the color you are, if you are here legally, we should all be treated equally.. even the white people who get lesser benefits because we are the majority and the affirmative action… but now, we are a minority in this huge US. I could go on.. but the bottom line, let’s all get along. I don’t treat people differently based on their color of skin, sexual preference, gender, heritage, religion or anything other than how they represent themselves and treat me. But I am tired of the govt bending over backwards to fix the minority of religion and change the constitution because it offends people… really… what about us Christians, white people.. who cares??? urgh This world is going to crap, for sure. Absolutely, Kristen–what our Constitution has come to mean is that ALL people are created equal. Sometimes, as you say, it’s pretty danged hard to see how society treats folks equally. Into my soul, I don’t believe we can legislate morality, though lo we try . . . The only solution is for hearts to change. I do believe equally as deeply in peace through culture. The more understanding we are, the more we seek to come to know those who are “different” from us, the more those prejudices fall away . . . Thank you for sharing what’s on your heart. I pray for our country every day. Sometimes, I feel like I am in my own little world and all is right, but when I look farther, I have to be on my knees. I am with you, Nelle. I’ve found myself on my knees of late far more than I ever thought possible . . . This is a complicated issue where feelings and emotions run deep. If we can all work on healing our own hates, it can change the world. The United States is a nation made of law. We must work within law to facilitate change as we heal ourselves. Thanks for a great thought-provoking post. I am heartbroken over all the recent violence in our country and around the world. I pray that we can work towards a world where our default is love and not fear. I live in North Carolina, and I, too, am often embarrassed by my state. Sometimes we just cringe, don’t we, Kimberly. And you pointed out the only antidote: Choose love instead of fear . . . I am all for equal rights and I agree with you that we all feel the same things, just are different colors. No one is better than the other and as far back as the Civil War and slavery, the colored people have not always been positive with the white-as they hate for what was done to them by the white race-which is so unfair. I am not racist. But I know so many people who are and it really saddens me, because I was raised to accept all no matter what race or color. I believe that no matter what color you are, you should be able to have your opinions, thoughts and feelings on certain issues. Absolutely, Joan. You know, I often wonder what a person does with all the resentment, once a horror is over. Tough to get past, but we must, we must. Susan – and now, since you’ve written this article – the killings of officers in Baton Rouge – yikes! De-valuing life seems to be at the heart of these ails, no? Yes, it does, Joan. What horrors we face these days . . .
“Stop spewing hate.” Ah yes. One of my favorite memes on Facebook is an illustration of skeletons, which all look the same, and under each one is a race label. We are all the same under the skins…we all have hopes, fears, joys, troubles, aspirations. Sadly, I don’t see anything getting better. I love that meme too, Jackie. And I believe if anything is to get better, we have to make it so! I appreciate your effort to be objective and to see the different sides of this horrible situation. So much to say, it is hard to boil it down. What I wish for America is that journalists would return to being journalists, that Americans, proud to have a voice, and a safe audience to post madening distortions that inflame and mislead, would learn they are part of the problem, not the solution, and politicians who have perfected the art of bending the issues to artfully support their ideology and keep them in power, would be held accountable by a battered and bruised skeptical electoric. Yep, all sides have a piece of this, no? Only be taking a hard look within, finding and admitting to our own prejudices and fears, can we begin to face those and bring something of value to the table. A tough order. I truly, into my soul, believe in peace through culture. And that means reading, learning, finding out the facts on one’s own. It all comes down to us, in the end. Isn’t that just it, Kathy–we all really do want the same things. And it’s like with any issue, anything grows so much stronger when it’s depersonalized as “other.” Once we personalize something, come to know the “other” in our midst, we see just how similar we all are. Thank you for your thoughts!